New ropes on order, new sally colors to be: green, pink and blue! We raised six bells and had seven ringers overall. New ringers practiced finding their way in rounds on five. More experienced ringers worked on calling and call changes. We called 2 to 3 on four to ring “Baby Queens” for Lily! After practice we had a final discussion with regard to new colors for the rope sallies on next order. We look forward to Interim Captain Andrew’s visit during the month of October as we are eager to progress in so many ways! 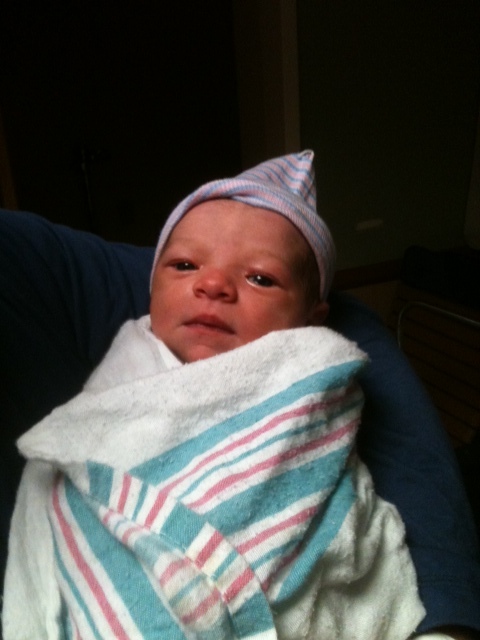 Lily Enlow Alspaugh (aka baby bell) arrived yesterday at 7lb 4oz! In celebration we dedicated a “baby touch” of call changes on eight bells. Congratulations Thomas & Courtney! Rumor has it that our newest ringer’s got it down, or rather – up, in terms of “ringing up” that is! Six ringers practiced rounds and call changes 2 to 3 and 4 to 5. Helpful Hint: It’s important to know who the bell you are following, is following (not one but two bells in front of you), because if the bell you are ringing after is called to change, in turn, you will have to then ring after that other bell. We stumbled a bit practicing Plain Hunt on Four, but lucked out with one of our new ringers doing a great job with Tenor behind. Plain Hunt puzzle of the day: Is it better to memorize, count places, or meander “evens up, odds down.” Best to just keep practicing and let it sort itself out! We had seven ringers for the service touch today. We rang in rounds, then progressed to call changes and then rang down in rounds ending with a cheer from the band! At one point the 3 bell was giving the new ringer a hard time and was coming down. Barbara gracefully stepped in to assist with gaining control and then Anne took over and set the bell. Good job ladies! If our former Captain was watching (virtual webcam) he would have been very proud. Helpful Hint Repeat: Follow through, always follow through on both hand and back strokes in order to give the rope ample time to raise and lower so that you can adjust control as needed. Ken, Marguerite, Jody, Bobbie & Jorge worked on ringing rounds. It was a good practice session for new ringers to get a feel of finding their way in the ringing order at a steady pace and on different bells. Helpful Hint: it’s important to “follow through” with your rope at all times in order to maintain control of the bell. That way you can speed up or slow down as needed.